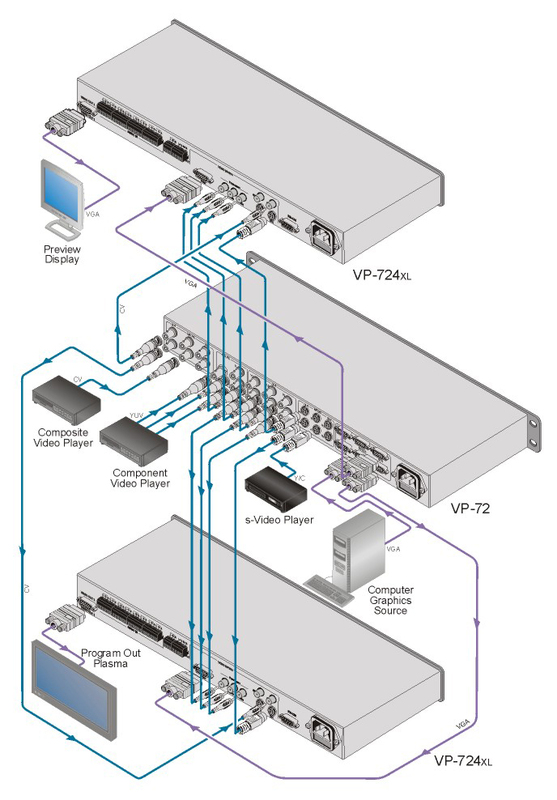 The VP-72 is a seven input multi-format distribution amplifier for composite, s-Video, component (HDTV or SDTV), and computer graphics video signals with resolutions up to and exceeding UXGA. It was designed from user feedback to complement Kramer's ProScale� digital scaler/switcher line and includes seven 1:2 distribution amplifiers in one package: two composite, two s-Video (Y/C), one component, and two computer graphics video. High Bandwidth - Composite: 500MHz; s-Video: (Y) 520MHz; YUV (Y) 470MHz; VGA: 485MHz (all values at -3dB).